Barbecue tempeh is definitely my favorite tempeh recipe, but tempeh cheesesteak sandwiches are a close second. Whisk together the balsamic vinegar, the mushroom sauce, and the soy sauce in a small bowl. My tempeh comes in 425 g packages, I slice it thinly along the short side. Then I add it to the marinade, give it a stir to make sure it’s well coated, and set aside. Most of the places I shop only sell pre-packaged produce. I can buy a bag of red peppers, or a package of 3 assorted red, green, and yellow peppers, but I cannot buy just a green pepper. It’s weird. I also need to buy a whole bag of tomatoes, even if I just need one. Anyway, that’s why I used a red pepper for this recipe. I would’ve preferred a green pepper and a red pepper, but I had an orphaned red pepper from the aforementioned trio, and didn’t want to end up with two more odd peppers, so I just used the one. Heat a bit of olive oil in a skillet, add the veggies, sprinkle them with some salt and pepper, and cook them until they begin to soften. 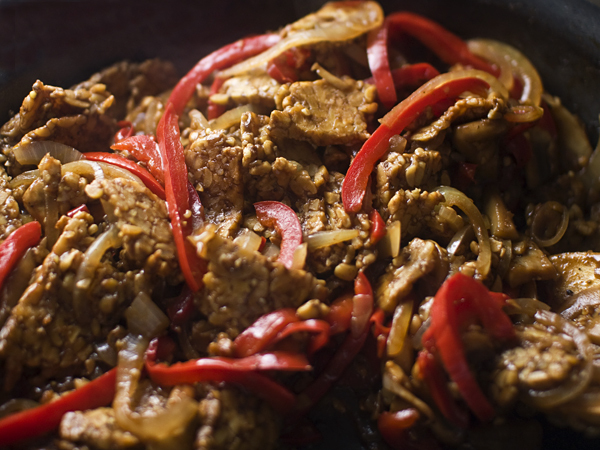 Add the tempeh and the marinade, and continue to cook everything until the marinade is absorbed and the tempeh is heated through. Then, I stuff it into a baguette. I’d like to say I melt a bit of provolone over the top, but we don’t have provolone here, so it’s actually a cheeseless steak sandwich. And, my A-1 stash is exhausted and since I won’t give in to extortion, I usually drizzle a bit of this bbq glaze over the top instead.